Pictures and info about all Alaskan license plates on the road today. A one-page bestiary of all current Alaskan plates. More than you ever wanted to know. Trust me. Oldest plates, newest plates, most stickers, etc. Request a photo shoot or get your own collection page! The '66 totem, the '76 grizzly bear, and more. What should and should not be on a plate - and interesting exceptions. Pictures and information needed -- can you help? Alaskan license plates news, events and timelines. A recently-renewed effort; help needed! 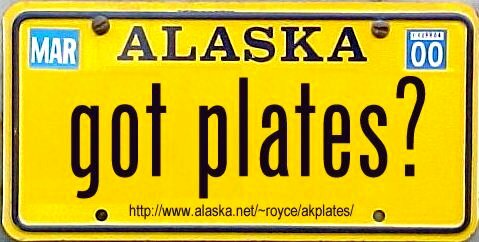 Alaskan and other plates on the Internet. Do you have an interesting plate? Tell me about it and/or send me a picture! akplates.org was created 1998-07-23. Last updated 2018-05-26. XHTML 1.0.